SALT LAKE CITY -- When word first arrived Tuesday afternoon that Gordon Hayward planned to sign with the Boston Celtics, Isaiah Thomas' wife, Kayla, posted a video to her Instagram story of a shirtless Thomas dancing around in his kitchen with "Big Rings" by Future and Drake blaring. Thomas is arguably the NBA's most underpaid player. One season after finishing in the top five of MVP voting and earning a spot on the All-NBA second team, his salary will actually drop to a mere $6.3 million this season. Although he could have lobbied Boston to use its cap space this summer to accelerate his impending payday, Thomas instead implored Celtics president of basketball operations Danny Ainge to use that money to seek the talent that could push Boston closer to title contention. 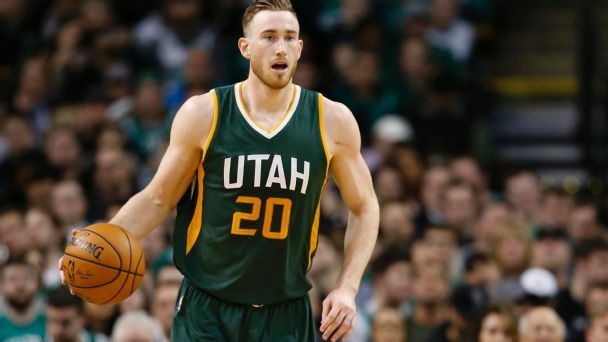 Ainge obeyed, and with help from a Brad Stevens-led sales pitch, the Celtics were able to lure Hayward from the familiarity and comfort of Utah, where he spent his first seven NBA seasons. In an Eastern Conference in which much of the star talent has flocked west, the Celtics landed the biggest prize on the free-agent market -- at least among the players who weren't slam dunks to re-sign with their current teams, such as Stephen Curry and Kevin Durant. The arrival of Hayward could help the Celtics narrow the gap between Boston and Cleveland at the top of the East. Thomas clearly couldn't have been happier with the signing. "The type of player we needed to get to the Finals," Thomas told ESPN's Adrian Wojnarowski, not-so-subtly suggesting that Boston now has the sort of talent that will make it more competitive against the East's top dog. Added Thomas: "I'm excited and can't wait to get to work." Hayward's arrival will force the Celtics to tweak their roster in order to fund the four-year, $128 million contract he'll ink. Boston started that process Tuesday night by rescinding its qualifying offer to center Kelly Olynyk, which made the floor-stretching big an unrestricted free agent. Boston will likely renounce its rights to a series of veteran free agents such as Jonas Jerebko and Gerald Green (players who could always come back on low-cost deals), waive the non-guaranteed salary of Jordan Mickey and waive or trade the partially guaranteed contract of Demetrius Jackson. The harder decision looms with moving at least one key rotation player in order to fully create max cap space. The Celtics will consider the trade market for Avery Bradley (a free agent after this coming season), Marcus Smart (restricted next summer) and Jae Crowder (still on a sweetheart deal, but that could increase his trade value). Crowder might seem like the odd man out, especially considering he plays the same position as Hayward and didn't particularly like when fans cheered Hayward in Boston last season. Still, Crowder has been vital to Boston's success and shouldn't be moved simply to cut salary. Stevens can figure out how to make all the pieces work together. What's more, Boston has an intriguing young core to supplement its new star core of Thomas, Hayward and Al Horford. The Celtics have the No. 3 pick from each of the past two drafts in swingmen Jaylen Brown (whose role elevated in the 2017 postseason) and Jayson Tatum (whose scoring potential could help him find minutes early in his NBA career). Ainge still has a hoard of draft picks at his disposal, including the Brooklyn Nets' 2018 first-round pick and, potentially, the Los Angeles Lakers' 2018 first-round pick (if it lands in spots 2-5). Ainge could cash in some of those picks for proven talent, someone such as a Paul George, if Indiana hadn't panicked and moved him west last week. What's obvious with the Hayward move is that the Celtics are going for it here. After the Golden State Warriors rumbled through the Cavs in the NBA Finals, Ainge was asked if teams might throttle down and look to the future because the Warriors -- and, to a lesser degree, the Cavs -- were so dominant last season, especially in the postseason. Ainge was adamant that Boston wouldn't just punt because of the talent at the top of the NBA. Ainge said the team would progress cautiously but still wanted to add players who could help the team take a step forward. The Celtics did that in landing Hayward. Hayward was one of the league's most efficient scorers, averaging 1.091 points per play and ranking in the 91st percentile among all NBA players last season, according to Synergy Sports data. He was particularly sharp in the pick-and-roll, on which a whopping 28.6 percent of his total plays were generated. It will take some time for Hayward and Thomas to figure out how they complement each other on the floor, but both are likely eager to work that out. Thomas, the leading scorer in the East last season, will not have to shoulder as much of the scoring load. Hayward gives Boston a viable option to keep the offense afloat when Thomas goes to the bench. Defensively, Stevens will love the versatility that Hayward adds to a switch-happy group of wings. Stevens often talks about position-less basketball, and Hayward plays right into how Stevens wants his defense to operate. Should the Celtics be thinking about Big Rings? That's a bit premature, but Boston made the sort of big-splash move that's going to make the rest of the league take notice. Thomas missed much of the East finals due to a hip injury. But the Celtics clearly believe that with a healthy Thomas, Hayward, Horford and the rest of their young core, this team has the potential to push the Cavs in the East. In discussing his reason for signing in Boston in an article on The Players' Tribune, Hayward noted that he and Stevens have big aspirations, considering their past. "That unfinished business we had together, back in 2010, when I left Butler for the NBA," Hayward wrote in reference to Butler's falling in the national title game when Hayward's half-court heave didn't drop. "As far as I'm concerned, all of these years later, we still have it: And that's to win a championship." The Celtics are going to like the ring of that.